Eight families from Syracuse’s south and west sides participated in the South Side Newspaper Project’s Summer Storytelling Series, “From Where We Stand.” The mission of this project was to spotlight family life by putting real families behind the camera. To do this, the publisher of Syracuse’s South Side community newspaper The Stand set out to organize a project that would give residents the tools to tell their own story. Thanks to a grant from the Gifford Foundation and support form Syracuse University’s Near Westside Initiative, the Newhouse School, WCNY and the Allyn Foundation, each participant was provided a Nikon DSLR camera and paired with a professional mentor. Final photo collections are currently on display in the Link Gallery at the Nancy Cantor Warehouse, 350 W. Fayette St. The exhibit will be up until mid-October and can be viewed during normal business hours, Monday through Friday. 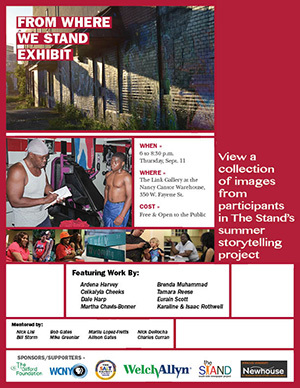 A reception will be held at 6 p.m. Thursday, Sept. 11, where participants and mentors will discuss their work. The event is free and open to the public; appetizers and beverages will be provided. Also during the event, final short films will be screened in the auditorium on the first floor. The teams first met June 5 to receive their equipment and get acquainted with each other and the project’s goals. Learn more about each mentor and participant on the project’s website: http://FromWhereWeStand.net. Because each participant is paired with their own professional mentor, each has a unique experience tailored to their skill level and focused on what story they want to tell. For example, Harp is paired with professional photographer Bob Gates. Harp worked this summer to interview and photograph teens who utilize the Faith Hope Community Center. His focus was to highlight why these teens have the discipline to stick with the program and why others who have attempted to train at the center left, opting instead to pursue a life on the streets. And Gates has been right at his side, offering hands-on guidance to learn the camera or being available to answer a quick question.